With each season, each day, each wind shift – a new form emerges, what was previously hidden is now revealed. For 440,000 years the sands have been washed down stream and laid to dry. Like helping a friend in need, the winds return the sand to its cove at the base of the Sangre de Cristo Range. Westerly winds bring new sands across the high Colorado deserts, but the power needed to carry the sand over the immense mountain range fails. A new layer is added, another dune is formed, continuing the ancient cycle of growth and change. 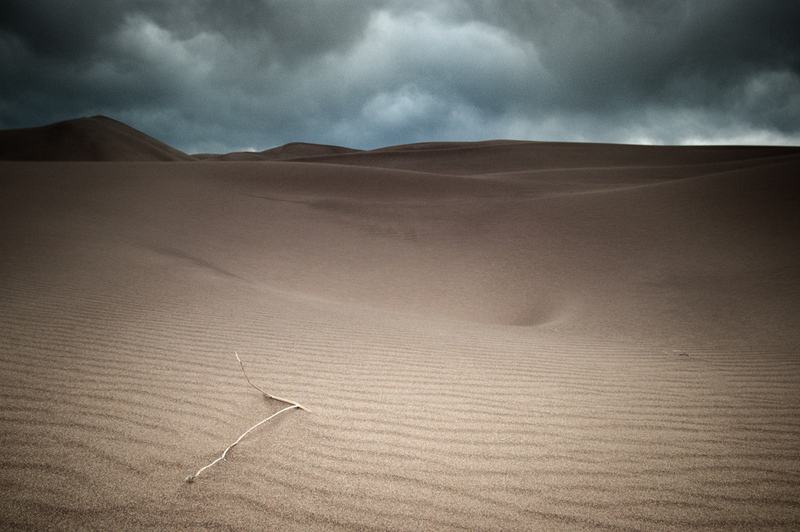 Taken at the Great Sand Dunes National Park and Preserve, Colorado – more information here. Beautiful composition. Looks a bit dark in the top part (filter ?) but that adds drama to those clouds. Yes, I used a graduated neutral density filter, my old D70s has a bad habit of creating blown out skies. Wo ever would believe this is in Colorado??!!! Splendid colours, lights & composition. It looks noisy, but that somehow adds to the atmosphere. Nice. Very filmic. What an immense view. It looks endless.